With Earth's orbit cluttered with dead satellites, discarded rocket boosters and other space junk, ways to prevent the accumulation of such debris are desperately needed. How about using a tractor beam to steer future junk aside, says engineer John Sinko. Sinko's idea is based on an experimental type of spacecraft engine called a laser thruster. Inside these motors, laser pulses fired into a mass of solid propellant cause a jet of material to be released, pushing the craft in the opposite direction. Sinko, a space-flight engineer of Nagoya University, Japan, realised that the laser did not necessarily have to be on the same craft. "These on-board motors could also be targeted remotely by lasers for tractor beaming," he says. He has designed a series of laser thrusters that can be activated in this way. A spacecraft fitted with a laser would fire a low-power beam at a thruster fitted on another craft to attract, repel or steer it in another direction. Pushing a spacecraft away is a relatively simple matter, but more complex designs using mirrors are needed to use a beam to tug one towards the laser (see diagram). Combining those designs could allow full control in any direction, says Sinko. He imagines spacecraft being fitted with remotely operated thrusters before launch, so that once they reach the end of their lives it is simple to alter their orbit or even shove them into the atmosphere to burn up - even if they have lost all power (Journal of Propulsion and Power, DOI: 10.2514/1.46037). Tractor beams could be fired from up to 100 kilometres away, says Sinko, either from a spacecraft in orbit or a mirror in space redirecting a beam from Earth. "It's an interesting idea that could work in principle," says Richard Holdaway, director of space science technology at the Rutherford Appleton Laboratory in Didcot, UK. Keeping a laser beam accurately trained on a distant motor would be a challenge, he adds, "but perhaps not an insurmountable one". 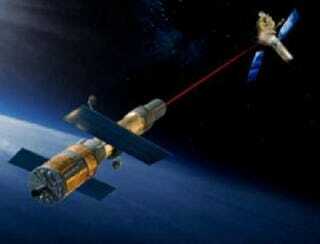 Sinko hopes to test one of his tractor beams on a 10-kilogram satellite within a few years. He is not alone in trying to develop such technology: a team at the Research Institute for Complex Testing of Optoelectronic Devices and Systems in Sosnovy Bor, Russia, is working on similar ideas. This post by Paul Marks originally appeared at New Scientist.